It’s another Fruit of the Spirit entry. I’ve truly enjoyed my study of this section of scripture. It is so full! I have some blog posts on other some other sites too if you’d like to check them out. Lately, I’ve been working so hard at my job, extremely long hours, giving all that I have and more, that I feel completely depleted of energy. It is easy to become irritable and snappy when you’re that tired and drained. Bearing fruit? My fruit has been pretty rotten, I’m afraid. That’s because I haven’t been drawing from the Spirit. Sure, I’ve been having my morning devotion time; but it has been rushed and shallow. When that happens, it’s hard to walk in the Spirit throughout the day. I need to slow down–if not in time, in attitude. I need to savor the sweet Spirit, and then the sweet fruit of the Spirit will emanate from me throughout the day. Only then can I bear His fruit. For this page, I was inspired by the design on a bottle of Victoria’s Secret Fragrance Mist. Don’t be afraid to use patterns and designs that you like, even if they come from random places! 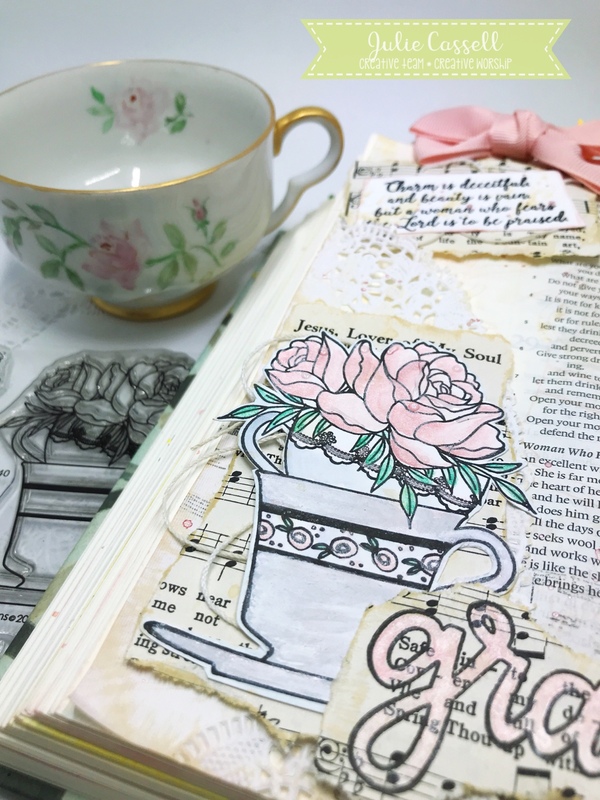 I recreated the design on my Bible page by two-step stamping, using Sweet’n Sassy Stamps “Fruit of the Spirit” stamp set, distress oxide inks, and Ranger Letter-It Embossing Kit. I have a process video on my YouTube channel where you can see how the whole page came together (see the link below). How do you slow down and savor your time with the Spirit? Share a comment below.